As our store has grown over the years, processing registrations has started taking time away from our first priority of offering our store customers the best service possible. Since the BMV is processing registrations now, we are no longer doing them. The closest BMV to our store is at Jaeger & Route 58 by Kohl's. to look up other agents in Erie & Lorain counties, or click on any other county that may be more convenient for you. Getting a vessel registered is not the same as licensing your car. The ODNR & BMV operate differently. If you don't know what you need to get a registration, call and ASK US before visiting. And don't wait until you're ready to cruise! If we can't issue, renew or transfer your registration last-minute, it could ruin your plans. Check your expiration date before you head out. Always keep your registration on board. If you get stopped for a safety inspection, you'll be asked for it. 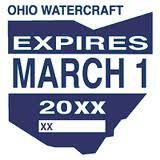 The Ohio-shaped decal is for a Traditional Registration for power, sail, and hand-powered vessels. Agents issue, renew & transfer these decal sets and OH#s. The larger decal is an Alternative Registration for hand-powered vessels, which now can be issued by agents as well. If you plan on adding a motor any time in the future, do not do an Alternative Registration. The Basics: We are required to follow the laws & procedures of the ODNR. So please don't ask our people to "bend the rules." Without proper information and paperwork, we cannot issue registrations. You'll need your driver's license, whether you are the owner(s) or have Power of Attorney. All owners must be present, or the person obtaining the registration must bring in a valid Power of Attorney for anyone not present (Power of Attorney is for renewals only - for new registrations, all owners must be present). OH#s stay with the VESSEL for life, NOT the person like a car registration and license plate. When you sell a watercraft, make sure you transfer the registration to the new owner, whether or not the registration/decals are expired. When you buy a watercraft, make sure you ask the previous owner for the registration, as well as the Title, Statement of Origin, Certificate of Origin, or notarized Bill of Sale (paperwork will depend on the size and type of watercraft). See the charts below the FAQ for fees and procedures. Q: What vessels are required to have a registration? A: If it's used on Ohio State waters, it needs to be registered... Yes, even pedalboats, canoes, kayaks, and inflatable rafts with oars. (Paddleboards, sailboards, and kiteboards are exempt.) Owners of homemade vessels must apply for a serial # before obtaining a registration. If you need to find the serial #, it's usually a 12-digit number (except on very old vessels) on or near the transom (rear). Small toy rafts that do not have a serial # do not need to be registered. expired, what do I need to do? A: The quickest way to get your decals is to bring us your previous registration or the ODNR's renewal form. If the registration has missing or incorrect information, bring your title so we can make corrections. If you start your registration process online or through the mail with the ODNR, you must wait for your decals to be issued by them. We cannot issue decals for you after you have started that process with the State. Q: If I bought a new watercraft never registered before, what do I need? A: The same paperwork is required as a new vessel, except you also bring the previous registration, and we transfer the OH# to you instead of assigning a new one (the OH# stays with the vessel, not with the person). If it's not from Ohio and no title is required, bring the out-of-state paperwork, and we assign the vessel an OH#. If the vessel requires a title, transfer it at the Title Bureau first, then bring the new title to us, and we'll transfer the Ohio registration to you, or assign an OH# if it was previously from out-of-state. Q: If the decal isn't expired, do I just wait to transfer the registration? A: NO... The registration should be transferred to you immediately. The fee is only $5 for unexpired transfers, and the ODNR & other agencies often rely on the OH# to identify the vessel's owner(s), for example, if it has been stolen and recovered. And if the vessel is not required to have a title, the person whose name is on the registration is the owner until you transfer it. A: If you can't obtain any previous copies, bring your title or other proof of ownership (type of proof will depend on size and type of watercraft), and get the 8-digit OH# from the hull. Depending on how busy our store is, we can check the information while you wait, and you can leave with your registration and decals. If you don't know your OH#, we can't find it with your social security number like the BMV can do for car tags. So please don't show up with no information and expect us to be able to issue your registration. Q: What if I lost my current registration and/or decals? A: The ODNR can issue duplicates for unexpired registrations and/or decals. We have the duplicate request forms here, but agents cannot issue duplicates. You can mail the form and fee to Columbus, or visit one of the ODNR District Field Offices. The closest offices to this area are Sandusky and Cleveland. Q: What if my vessel is documented? A: Agents cannot issue, renew or transfer registrations for documented vessels. The ODNR Columbus Headquarters & District Field Offices issue these. If you purchase a documented vessel and you want to get an OH#, along with the title, you also will need to bring the paperwork verifying the vessel is no longer documented, and we can issue the registration and decals. Q: What is the difference between WROS and TOD? A: If WROS (with rights of survivorship) appears on the title, it means all of the names listed on the title are owners, with entire interest going to the surviving owner(s) upon death. All owner names are listed on the registration. If TOD (transfer on death) appears on the title, the beneficiary is not listed on the registration, because they are not an owner. Ownership is transferred to this beneficiary upon the death of the owner (if the vessel is titled, the title must be transferred before the registration can be transferred). Q: When is the best time to get my registration? A: Avoid peak retail days and times. Registrations usually take 5-10 minutes (sometimes less). But if there are others ahead of you, there may be a longer wait. If you're local, please allow Saturdays & Sundays for weekenders and stop in during the week. If you're a weekender, try not to wait until the day you'll be venturing out. Plan ahead. Holiday weekends, and the days leading up to them, usually have much longer wait times. Please keep in mind that we offer registration & notary services as a local convenience to our customers. We try to accommodate everyone's needs, but on peak days & during peak hours, the store's retail customers needing our attention take priority over registration & notary services. If we haven't covered your situation, see the flow chart below. If you still need help, click "contact us" or call us with your questions. Any size or type of vessel, including Boats, PWCs (Wave Runners, Jet Skis), Canoes, Kayaks, Rowboats, Pedalboats, Paddleboards, and Inflatable Rafts, with or without Motor. Canoes, Kayaks, Pedalboats, Paddleboards, Rowboats, Inflatables, if NO MOTOR is used, gas or electric. (If a motor is added later, see the Adding a Motor section below - Registration must be updated.) If you know you'll add a motor later, you save $3.00 by listing the vessel as motorized when you originally register it, rather than adding the motor later. Measurement is determined by length shown on title. All amounts listed include ODNR agent fee. There is no tax.